Excalibur defeats Nigel and the RCX. Nightcrawler realizes Kitty is an impostor, confirming that Nigel is up to no good. He & Cerise shake their Warpie guards and teleport to where their teammates are being held captive. 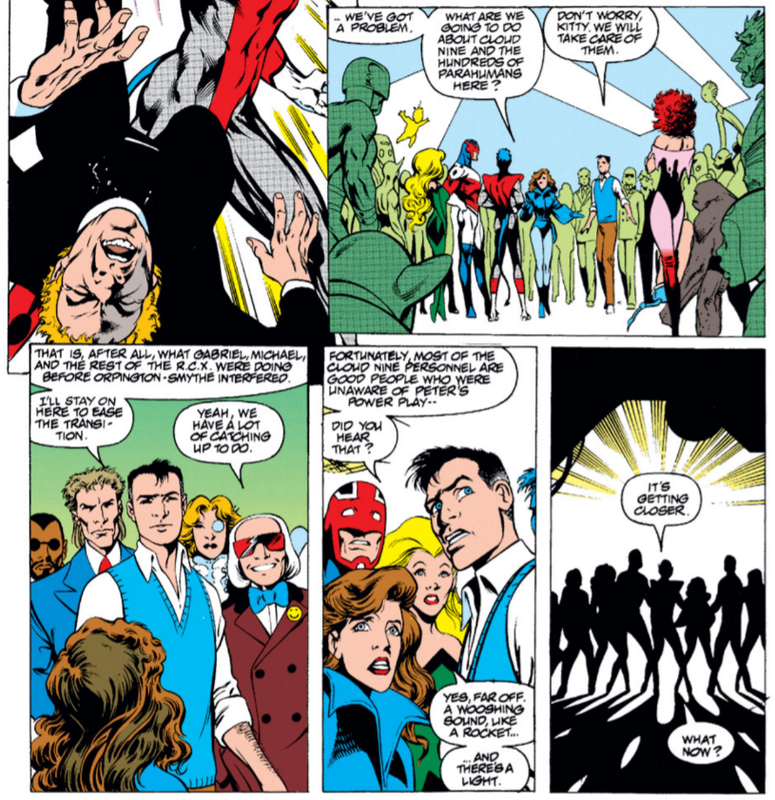 Meanwhile, watching from Otherworld, Roma promises to keep her vow not to interfere, even though Captain Britain faces certain death. 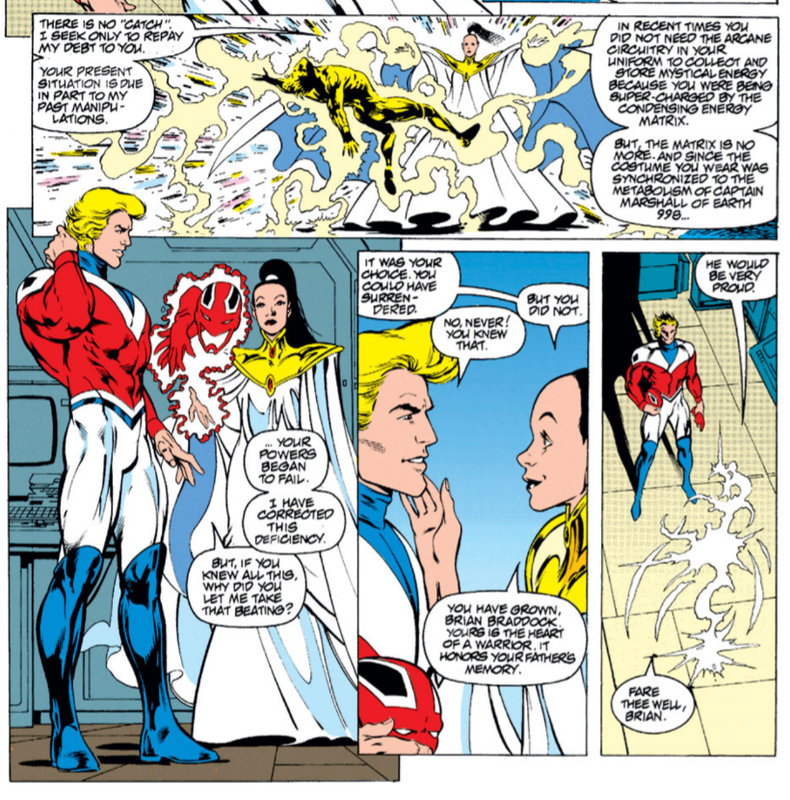 At Cloud Nine, Nigel attempts to coerce Captain Britain into serving his agenda, but Captain Britain discovers he's been tricked about Meggan's comatose state. His ruse revealed, Nigel sets the Warpies to attack Captain Britain. Elsewhere, a fight breaks out between more Warpies and the revived Excalibur, though some of the Warpies join the side of Excalibur, whom they've come to like. As word of the fight spreads, Nigel orders the rest of the Warpies away, leaving behind a badly beaten and dying Captain Britain. Roma then appears before him and revives him, paying him back for her previous manipulations. 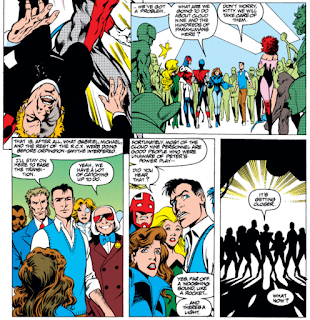 As the battle rages, Nigel gets the drop on Nightcrawler, but Captain Britain intervenes, saving him and allowing Nightcrawler to knock out Nigel, ending the fight. In the aftermath, Alistair agrees to look after the remaining Warpies, just as Rachel appears before her friends, declaring that with her memories fully intact, she now intends to return to the future, hoping the power of the Phoenix can make a difference there. 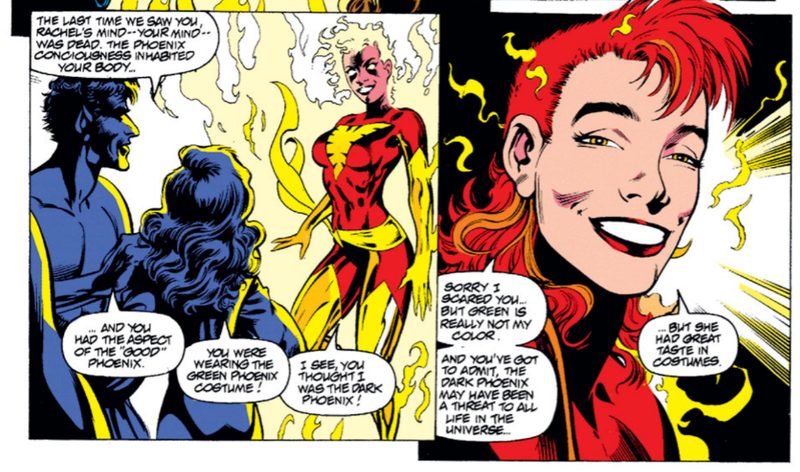 Phoenix reunites with her teammates at the very end of this issue (declaring she's going to return to her home timeline in a setup for Davis' next - and final - storyline), and the potential Dark Phoenix tease from the end of the previous issue turns out to be a gag on Davis' part, as Rachel declares she simply likes the red-and-gold look better. This will remain her costume until she leaves the series for good with issue #75. 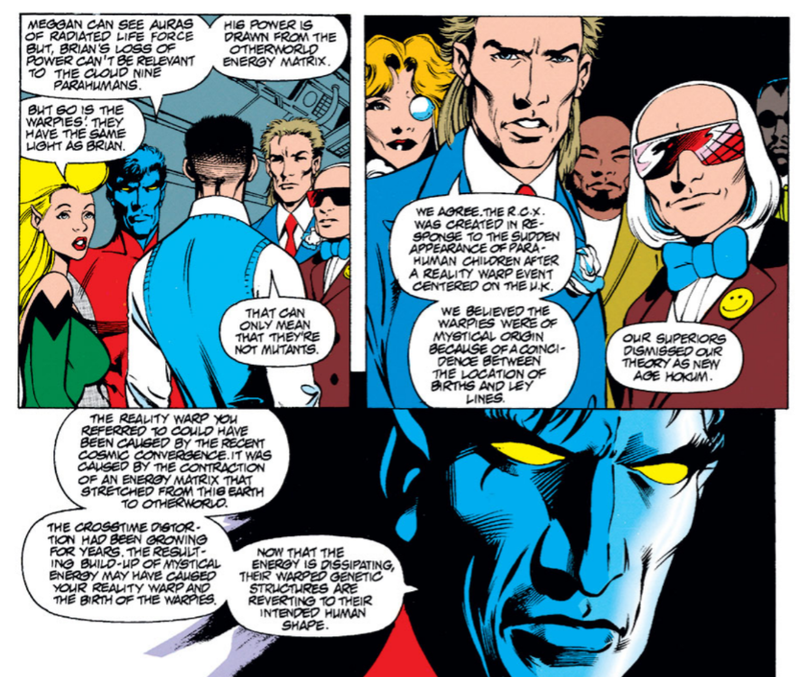 In the wake of the analysis conducting on his abilities a few issues ago, Nightcrawler's powers get tweaked a bit here, as a result of his having gained a better understanding of how they work. He says that his "invisible in shadows" business is a result of his body sliding into the dimension through which he teleports, while he also is able to teleport somewhere just based on the coordinates, even if he hasn't been to the location previously (obviously, if those coordinates led him to materialize inside a wall, he'd still die). 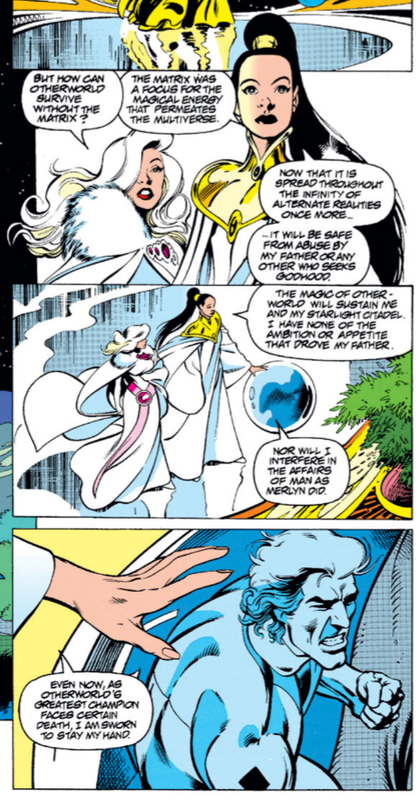 This is presumably how he teleported to meet Forge in Uncanny X-Men #300 (though technically, that appearance occurs before this issue). In something of an abrupt escalation of their ongoing romance, Nightcrawler & Cerise declare their love for another before going into battle. Davis closes the loop on some more Captain Britain solo series business, revealing RCX agents Gabriel and Michael to have been prisoners of Nigel's. They, together with Alistair, agree to take charge of the RCX and look after the Warpies; this marks the final appearance of Alistair in the series (or anywhere) until issue #96. 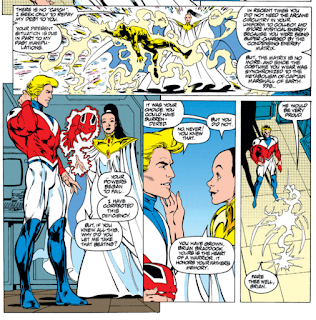 This issue finally reveals why Captain Britain's powers have been so wonky - a combination of the cessation of the energy matrix which powered all Captain Britains (as seen in issue #50) and the fact that his suit, which was intended to store the mystical energy of Britain and disperse it as needed when Captain Britain was away from the country, was taken from an alternate reality Captain Britain, so it was less efficient for Brian. Roma proceeds to fix the issue moving forward. 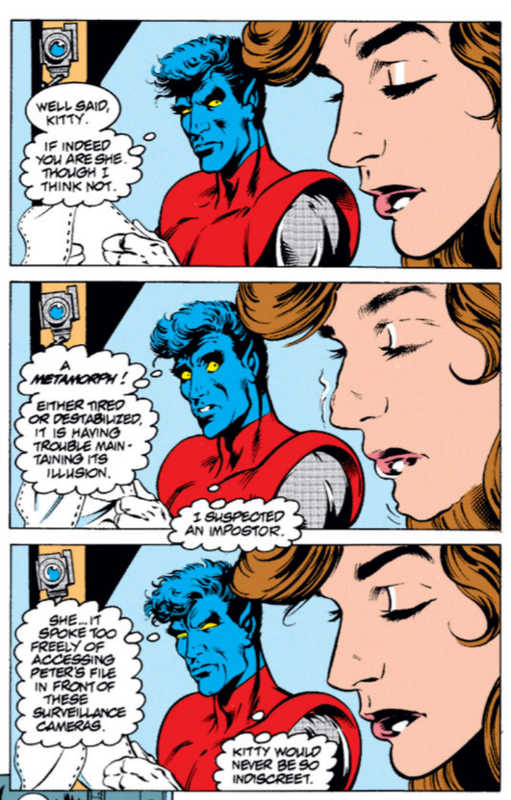 To his credit, Nightcrawler almost immediately recognizes the imposor Shadowcast as an impostor the moment she shows up. 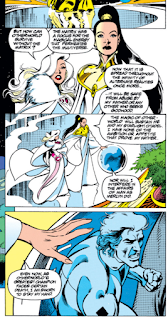 Watching events at the RCX, Roma tells Saturnyne she will honor her vow not to interfere in Captain Britain's life anymore, though she does later pass along the info about his power fluctuations. 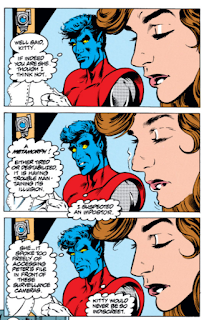 The whole "generic disorder affecting mutants" thing turns out to be specific only to the Warpies, a result of the unique circumstances of their births. The RCX story comes to a close, and given how frustrating the pacing of the previous chapters of this story have been, it's a shame the conclusion feels so rushed, with several significant reveals and events crammed into its 22 pages. 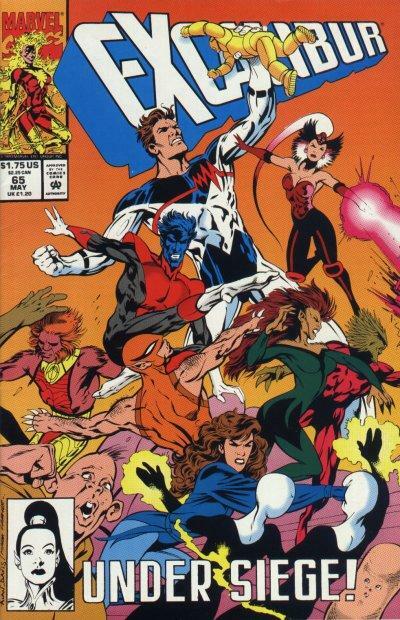 While it's nice to have Nightcrawler upending genre conventions and immediately cottoning that the Shadowcat he's hanging out with is an impostor, everything else that goes down in this episode goes down really fast - Captain Britain is both seduced to Nigel's side and turns against him, then almost dies but is saved by Roma; upon realizing Kitty is a fake, Nightcrawler turns the tables, shaking his and Cerise's Warpie guards so quickly it makes one wonder why Excalibur was playing along in the first place; even the final battle mostly happens offscreen, which, after so much build up, is somewhat deflating. Given how drawn out and wheel-spinny the previous two issues felt, it would have been nice to see some of the events in this issue use that space. 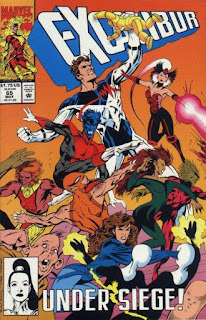 Still, even a disappointing issue of Alan Davis' Excalibur is an enjoyable one, and all the hallmarks of his run are still present - stellar art, the ability to mask continuity clean-ups in entertaining stories, and a strong grasp of the characters. 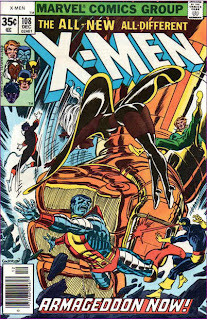 There's fun to be had in Nightcrawler taking charge, in seeing the Warpies turn on Nigel, in Captain Britain's rage at being duped, and the reunion with Phoenix (who manages not to be a deus ex machina in her return); it just would have been better if all of that had a little more room to breath, especially with Davis' departure looming. Next week: Uncanny X-Men #301, X-Factor #91 and Wolverine #70. "Hi, guys! Miss me?" is what "Dark Phoenix" says in UNCANNY #175 when she appears to the X-Men, but I wish Davis had done the homage to that issue and the final panel of #174 still a little bit more obvious. Nigel? Alistair? Did Excalibur ever meet a Cecil? If they get rebooted, will they meet a Benedict? Good point on this issue feeling rushed. It's almost like Davis decided to abruptly cut this storyline short and crammed all his resolutions into one issue. Unfortuately, this is about the end of my interest in Davis's run. I love the first chunk, up through issue 50, I like the second chunk with Sat-Yr-9 quite a bit, and I think this part is okay but not great. The stuff coming up, though, does nothing to me. I get so bored of nonstop returns to the "Days of Future Past" era! I really appreciated not just the invisibility explanation but the nod to how he’s usually depicted as being in shadow even in bright light. Surprisingly elegant and very welcome. Although there’s no attendant bump of his teleportation ability in terms of traveling great distances in one go or rapid succession, just a greater understanding as you said, meaning I’m still left to imagine he got to France in Uncanny #300 via an aircraft he parked off-panel a fair distance from where Forge was set up. 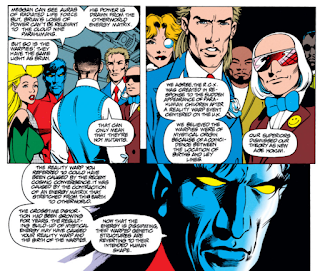 While this final chapter was perhaps rushed, I’m vastly more responsive to the incorporation/resolution of old UK Captain Britain stories and the character work you mention than Nigel Wossname’s plans for the Warpies, so no complaints on my end. I guess I agree with Rachel on the red outfit being more her color, but that freaking haircut absolutely has to go.